Aims: the purpose of this study was to investigate the effects of aquatic exercises on inflammatory markers of cardiovascular (homocysteine, C-reactive protein [CRP], and fibrinogen) in obese women. Materials and Methods: It was a semi-experimental with pre- and posttest design. Thirty-seven obese women volunteered to participate in the research, of which 28 had inclusive criteria for research. The age of participants ranged from 35 to 40 years and their body fat percentage was above 30%. The exercise protocol included a combination of resistance, stretching, and balance exercises that were carried out three sessions a week for 10 weeks. Statistical Analysis Used: Paired t-test and independent test were used to analyze the data. 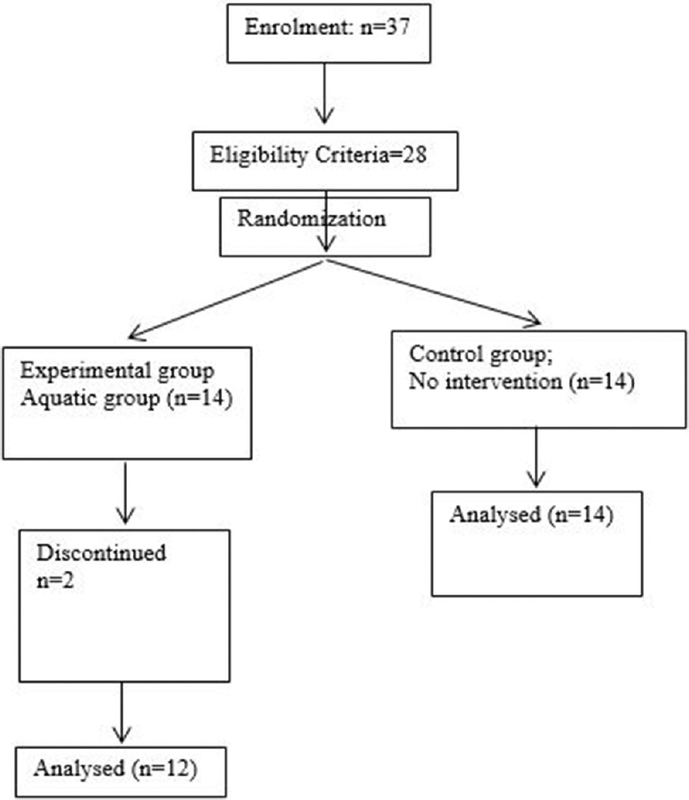 Results: The results suggested that homocysteine, CRP, and fibrinogen indices of obese women were significantly improved following combined aquatic exercises (P ≤ 0.05). Furthermore, a significant decrease in body fat percentage with improvement of cholesterol and systolic blood pressure were found in experimental group (P ≤ 0.05). Conclusions: The overall result was that combined aquatic exercises would not only attenuate cardiovascular risk factors such as homocysteine, fibrinogen, and CRP but also improve the other cardiovascular disease risk factors such as obesity, cholesterol, and blood pressure. Despite significant advances in the prevention and treatment of cardiovascular disease (CVD), these diseases are also the leading cause of death in the world., The American Heart Association studies reported that 2.4 million people in the United States die from various illnesses each year, of which 39% are due to CVD. Based on the World Health Organization, noncommunicable diseases (NCDs) will be accountable for 70% of all deaths in 2030 and CVDs are among the first four causes of death in worldwide. Based on the evidence, it seems that CVDs are the major causes of death in Iranian population., Fat profiles have always been used as a standard tool for identifying people at risk for CVD. However, the results of some recent studies indicate that CVD has been reported in people whose blood and body fat and cholesterol levels were in the normal range and even in some cases below the normal range. This suggests that other indicators may help identify those susceptible to CVD. In this regard, an indicator of CVD is the levels of C-reactive protein (CRP) that is highly predictive of heart attacks and stroke and progression of peripheral arterial disease. The risk of CVD in people with high CRP levels is about two-thirds higher than those with lower CRP levels. In the past decade, it has been found that inflammatory mechanisms play an important role in the pathogenicity process of several chronic diseases, including CVDs. Several inflammatory plasma indices have been introduced to predict CVD. Among these indicators, CRP, fibrinogen, and homocysteine are highly associated with increased cardiovascular risk. Therefore, any intervention, including exercise that reduces inflammatory indices, leads to a reduction in CVD. Exercise interventions have always been considered as an effective treatment for early inhibition, as well as treatment and control of NCD. There are several studies reporting that aerobic exercises make the hormonal, vascular, and structural nervous system compatible. These physiological adaptations included left ventricular reconstruction, improved ventilation, as well as reduction of catecholamine and overall peripheral resistance and changes in levels of vasoconstrictors.,, Although the benefits of aerobic exercise have well been documented on inflammatory and cardiovascular risk factors, obese people cannot easily do the exercises because of overweight and stress that comes from aerobic training on joints. Hence, we tried to investigate the effect of aquatic exercises (produce less pressure on the joints while exercising) on inflammatory markers of CVD in obese women. It was a semi-experimental with pre- and posttest design. Thirty-seven obese women volunteered to participate in the research, of which 28 had inclusive criteria for research (See [Figure 1]). The age range of participants was 35–40 years and their body fat percentage was above 30%. Body composition analyzer (Model in Body 320; Korea) was used to analyze the body composition (body fat percentage). The inclusive criteria consisted of lacking the history of specific illness or regular physical activity in the past 6 months, nonsmoking, having readiness for physical activity, no use of medication that could interfere with the study's objective, and body fat percentage ≥30%. These items were evaluated by a medical history questionnaire and a preparedness questionnaire as well as expert examination for physical activity. All participants' diet was under supervision of weight and health control monitored by food questionnaire recall. They were given diet based on recommended caloric intake specified by body composition analyzer. Participants were asked to avoid any heavy physical activity or stressful conditions 3 days before blood sampling. Participants were then taken to the medical diagnostic laboratory, and 8 ml of blood from their venous vein in a sitting position was taken by laboratory medicine expert. Blood samples were frozen at −20°C until the second test. Second stage blood sampling was performed 24 h after the last training session. The measurement instruments are cited in [Table 1]. 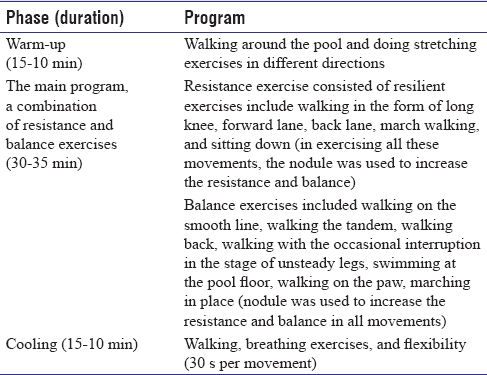 As it can be seen in [Table 2], the exercise protocol included a combination of resistance, stretching, and balance exercises that were carried out three sessions a week for 10 weeks (water temperature: 29°–30°C and water depth of 0.7–1.3 meters) in the shallow end of the pool. The procedures followed were in accordance with the ethical standards of the responsible committee on human experimentation (Imam Khomeini International University) and with the Helsinki Declaration of 1975. Paired t-test and independent test were used to analyze the data. The results suggested that body fat percentage of exercise group was significantly decreased after intervention (P = 0.002), while no significant change was found for control group (P = 0.64). As it can be seen in [Table 3], all inflammatory markers of CVD were significantly changed in exercise group after intervention (P ≤ 0.05). Furthermore, it was suggested that there was a significant difference in both groups after intervention (P ≤ 0.05). 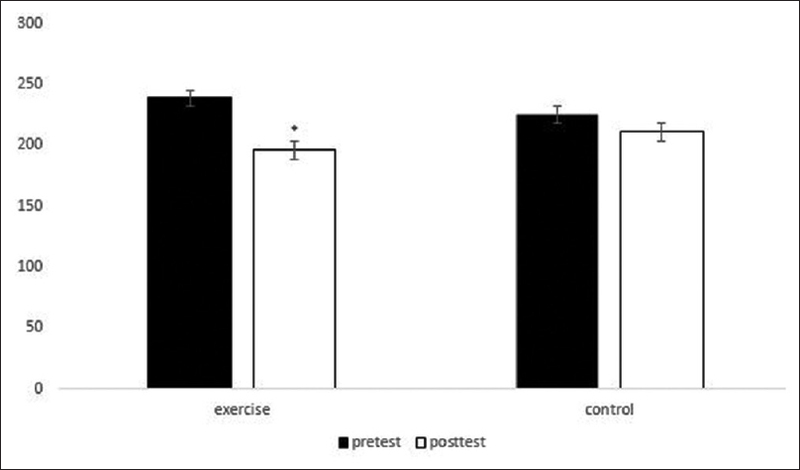 As seen in [Figure 2], cholesterol level was significantly decreased after exercise intervention (P = 0.02), while no significant improvement was found in control group (P = 0.07). 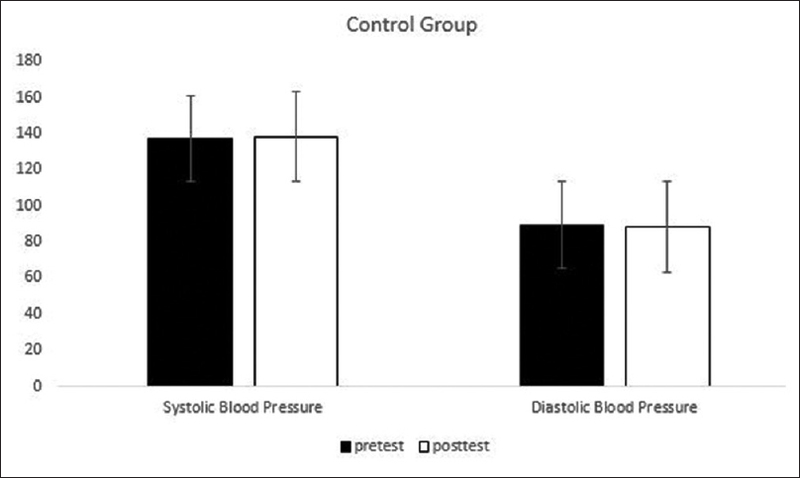 The results of paired t-test for systolic and diastolic blood pressure of the two groups can be seen in [Figure 3] and [Figure 4]. 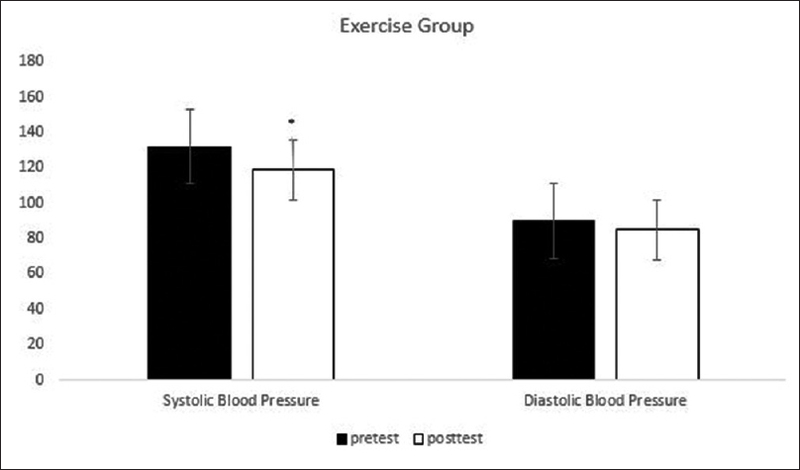 As suggested, systolic pressure was decreased significantly in exercise group (P = 0.04). However, no significant changes was found for diastolic pressure (P = 0.27). Dohi et al. showed that CRP can predict the incidence of CVD. In this regard, several prospective group studies also found that high CRP levels are associated with an increased risk of CVD. Since the effect of physical activity on the reduction of CVD and the association of physical activity with CVD and other cardiovascular factors has been proven, it is evident that physical activity has a significant relationship with low incidence of cardiovascular risk factors, which confirmed the results achieved in this study.,,,, Contrary to this study, several studies have reported that physical activity does not affect CRP.,, Several limitations must be considered in interpreting the results. First, we evaluated the effects of one exercise mode (aquatic exercises) on inflammatory markers of CVD in obese women; thus, our results may not generalize to the effectiveness of exercise therapy on these risk factors. Second, we cannot exclude the possibility that the association of inflammatory markers of cardiovascular risk factors was confounded by unmeasured factors. Low number of participants involving in the research is another possible limitation in this study. Research examining the effect of different kinds of exercise protocols on inflammatory risk factors is equivocal, which is partially due to a lack of control for confounding variables that impact CVD. In conclusion, these data offer that aquatic exercises would not only attenuate cardiovascular risk factors such as homocysteine, fibrinogen, and CRP but also improve the obesity of women. Other risk factors such as cholesterol and blood pressure were also shown to improve the following water therapy exercises. As a result, such exercises are highly recommended to obese people with cardiovascular risk factors. The overall result was that combined aquatic exercises would not only attenuate cardiovascular risk factors such as homocysteine, fibrinogen, and CRP but also improve the other CVD risk factors such as obesity, cholesterol, and blood pressure. We would like to thank all the participants who generously devote their time to the study. The research has been granted by Imam Khomeini International University. Jafari M, Pouryamehr E, Fathi M. The effect of eight weeks high intensity interval training (HIIT) on E-selection and p-selection in young obese females. Int J Sport Stud Health 2018;1:e64336. Mathers CD, Loncar D. Projections of global mortality and burden of disease from 2002 to 2030. PLoS Med 2006;3:e442. Rosamond W, Flegal K, Friday G, Furie K, Go A, Greenlund K, et al. Heart disease and stroke statistics-2007 update: A report from the American Heart Association Statistics Committee and Stroke Statistics Subcommittee. Circulation 2007;115:e69-171. Hunter DJ, Reddy KS. Noncommunicable diseases. N Engl J Med 2013;369:1336-43. Saadat S, Yousefifard M, Asady H, Moghadas Jafari A, Fayaz M, Hosseini M, et al. The most important causes of death in Iranian population; a retrospective cohort study. Emerg (Tehran) 2015;3:16-21. Amini M, Mirmoezzi M, Salmanpour M, Khorshidi D. Eight weeks of aerobic exercises improves the quality of life in healthy aged sedentary men. Int J Sport Stud Health 2018;1:e67514. Downs JR, Clearfield M, Weis S, Whitney E, Shapiro DR, Beere PA, et al. Primary prevention of acute coronary events with lovastatin in men and women with average cholesterol levels: Results of AFCAPS/TexCAPS. Air force/Texas coronary atherosclerosis prevention study. JAMA 1998;279:1615-22. Emerging Risk Factors Collaboration, Kaptoge S, Di Angelantonio E, Pennells L, Wood AM, White IR, et al. C-reactive protein, fibrinogen, and cardiovascular disease prediction. N Engl J Med 2012;367:1310-20. Hansson GK. Inflammation, atherosclerosis, and coronary artery disease. N Engl J Med 2005;352:1685-95. Sarrafzadegan N, Baghaei A, Sadri G, Kelishadi R, Malekafzali H, Boshtam M, et al. Isfahan healthy heart program: Evaluation of comprehensive, community-based interventions for non-communicable disease prevention. Prev Control 2006;2:73-84. Seals DR, Walker AE, Pierce GL, Lesniewski LA. Habitual exercise and vascular ageing. J Physiol 2009;587:5541-9. Nabilpour M, Mayhew J. Effect of peripheral heart action on body composition and blood pressure in women with high blood pressure. Int J Sport Stud Health 2018;1:e81874. Gibson AL, Wagner D, Heyward V. Advanced Fitness Assessment and Exercise Prescription, 8E. Human Kinetics; 2018.
e Silva Ade S, da Mota MP. Effects of physical activity and training programs on plasma homocysteine levels: A systematic review. Amino Acids 2014;46:1795-804. Deminice R, Ribeiro DF, Frajacomo FT. The effects of acute exercise and exercise training on plasma homocysteine: A meta-analysis. PLoS One 2016;11:e0151653. Joubert LM, Manore MM. Exercise, nutrition, and homocysteine. Int J Sport Nutr Exerc Metab 2006;16:341-61. Church TS, Finley CE, Earnest CP, Kampert JB, Gibbons LW, Blair SN, et al. Relative associations of fitness and fatness to fibrinogen, white blood cell count, uric acid and metabolic syndrome. Int J Obes Relat Metab Disord 2002;26:805-13. Dohi Y, Takase H, Sato K, Ueda R. Association among C-reactive protein, oxidative stress, and traditional risk factors in healthy Japanese subjects. Int J Cardiol 2007;115:63-6. Kazemi-Bajestani SM, Ghayour-Mobarhan M, Ebrahimi M, Moohebati M, Esmaeili HA, Ferns GA, et al. C-reactive protein associated with coronary artery disease in Iranian patients with angiographically defined coronary artery disease. Clin Lab 2007;53:49-56. Razavi A, Baghshani MR, Rahsepar AA, Mohaddes Ardabili H, Sheikh Andalibi MS, Reza Parizadeh SM, et al. Association between C-reactive protein, pro-oxidant-antioxidant balance and traditional cardiovascular risk factors in an Iranian population. Ann Clin Biochem 2013;50:115-21. Ehteram H, Bavarsad MS, Mokhtari M, Saki N, Soleimani M, Parizadeh SM, et al. Prooxidant-antioxidant balance and hs-CRP in patients with beta-thalassemia major. Clin Lab 2014;60:207-15. Nanri A, Moore MA, Kono S. Impact of C-reactive protein on disease risk and its relation to dietary factors. Asian Pac J Cancer Prev 2007;8:167-77. Stoner L, Lucero AA, Palmer BR, Jones LM, Young JM, Faulkner J, et al. Inflammatory biomarkers for predicting cardiovascular disease. Clin Biochem 2013;46:1353-71.